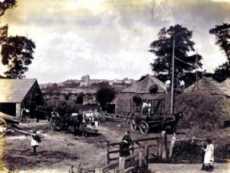 Farming and agriculture was the most common occupation for the men of Cottingham in 1841 and 1901. There would also have been seasonal work for women and children. In medieval times, a church bell was rung in the morning (usually 5am) to summon villagers to work. In Cottingham, another bell was rung at noon to tell workers in the fields that it was midday. Within Rockingham Forest there were areas of common grazing land for Cottingham and the neighbouring villages. Animals grazing on this land were branded with a symbol to identify them according to the local rhyme "Oakley O, Gretton G, Corby cross and Cottingham key". The key and cross symbols for Cottingham and Corby were also used on a boundary stone which used to stand on Cottingham Road. Thomas Peake, husbandman, Cottingham (Wd 13 Feb 1690) left five woods of land in Cottingham to his wife Elizabeth and eldest son Thomas. Elizabeth Peake, widow, Cottingham (Wd 30 Jan 1698) left the brown buck mare to Thomas Peake, a cow to Ann Chapman and, to John Peake, 'three maires and horse and geare and the waggon cart plows and harrows'. Daphne Joiner (nee Cannam)'s father was forced to leave school at 12 (in 1920) to work on his father's farm in Church Street. She recalls her father telling her tales of walking to Market Harborough with cattle for the market, and milking cows in the fields where Cottingham school is today before carrying the milk back to Church Street in pails on a yoke. He ran away from home at the age of 16 to become a gardener at Rockingham Castle!